Located off Dublin's main shopping mile, Grafton Street, The Westbury offers modern five star accommodation in a lively yet surprisingly private city centre location. 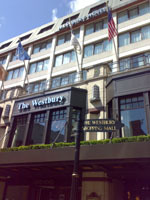 The Westbury has been a Dublin institution for family lunches and get-togethers for years. With a total refurbishment completed at the beginning of 2009, the hotel is now presenting a fresh look. The Westbury is tucked away just off Grafton Street in Balfe Street. The Westbury is a haven for serious shoppers. Ideally located for Dublin’s finest shops around Grafton Street and adjacent Clarendon Street, South William Street and Drury Street, the hotel building even houses its own exclusive shopping centre, the Westbury Mall. The Gaiety Theatre is a 5 minutes’ stroll away and many of Dublin’s most popular pubs and restaurants are within easy reach. Double rooms at the Westbury start from €189.00 per room per night, excluding breakfast. Breakfast is available at an extra charge of €15.00 per person when booked in advance together with the room. Suites have modern four poster king size beds and are available from €304.00 per night. The Presidential Suite features a private sauna, steam room and gym and is available from €879.00 per night. The Westbury has 7 meeting rooms which can cater for up to 50 delegates. In addition, the hotel’s main function room, the Grafton Suite, can accommodate up to 200 guests for receptions or events. Please contact the hotel directly for room hire rates. The Wilde restaurant offers traditional Irish cooking using prime local beef and fish from the Irish coastal waters. Or why not skip dinner and settle instead for a sumptuous afternoon Tea in The Gallery, watching the hustle and bustle of Grafton Street below. The Westbury’s Marble Bar is decorated in a decadent Art Nouveau style and provides a stylish setting for drinks into the early morning hours. All bedrooms have complimentary high-speed Internet access, iPod docking stations, Nespresso coffee makers and Blackberry chargers. A taxi from Dublin airport to The Westbury will take approximately 40 minutes and cost about €30.00 for a single journey. The Aircoach bus service to and from Dublin airport stops at the top of Grafton Street which is a good 10 minutes' walk from the hotel. A single adult ticket is €7.00 for the journey. The nearest Luas tram stop is the Green Luas stop at St. Stephen’s Green, a five minutes' walk away from The Westbury.